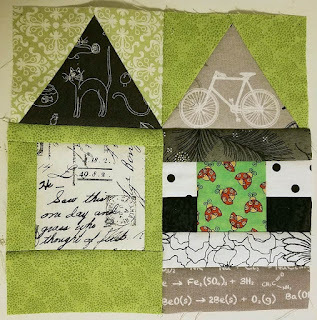 Who would have thought that the UFO for the month, a paper pieced project I'd been procrastinating for a couple of years, would trump the rainbow scrap challenge for what to start first? Certainly not me! But I'm still struggling with my project choice for the rainbow scrap challenge, and I knew it would create a big mess in my sewing space for quite a while when I started, so I decided to go for the UFO first. This block is called "filmstrip" and though it's not as obvious in this colorway, you can definitely see how it earned the name! While sewing, I decided to try "watching" something on Netflix. Usually I like to focus on what I watch when I decide to watch television, so I knew I'd have to choose something I didn't have to really pay attention to and decided to watch "The Office." I'd only seen bits and pieces of a few episodes and wasn't sure about it. Recently I'd seen a compilation on YouTube of funny bits and decided I'd give it a try. While so much of the nonsense is far beyond what would truly be tolerated in an actual workplace (I hope! 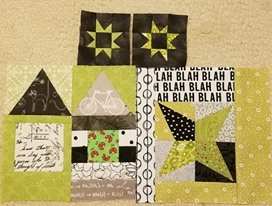 ), I am finding myself laughing and it makes tedious tasks like paper piecing a block of 180 pieces a little more enjoyable! This one is square. Once again I can't take squared-up photos with my phone camera. The colors are also a little off, due to late-night photography sessions. But even with templates, it came out okay. No worse than any others. Again, colors off and failure to take square photo, but done. 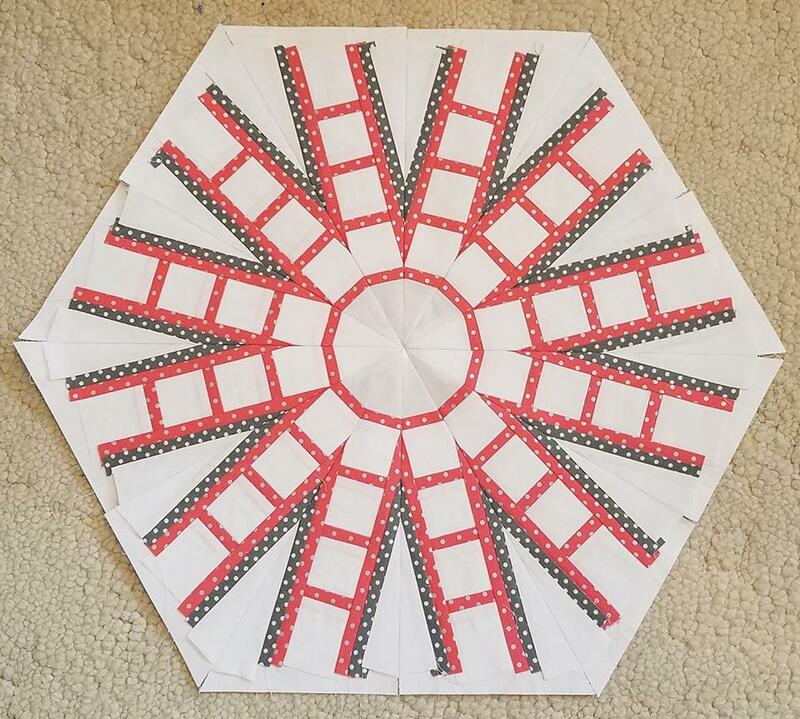 I decided to try paper piecing those center parts instead of templates. My results? I think they might be worse than if I'd used templates! But I'm at the point with this quilt that done is better than perfect. Hoping for better photos today, as I'll be sewing in the daylight. At least I should be if I get my behind in gear here soon! I think the center of your star block looks perfect. Lots of lovely greens while you wait for that squirrel to pop up. .... and your quilting neighbor ( a mile away lol) really appreciates you and your husband's willingness to help us 'old' folks out. Love your analogy of the squirrel project that slaps you in the face! Don't worry about straight on photos with your phone camera. Take them deliberately at an angle and quit worrying! 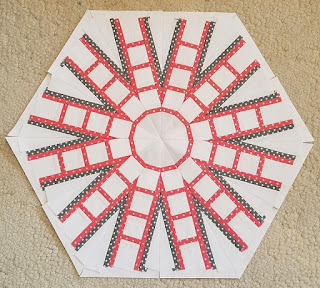 Hmmmm---in your paper pieced block, I saw firemen's ladders, not film strips. Of course, I worked at the fire dept., so you would know why I saw ladders. Anyway, it is a very interesting block. I look forward to seeing more of what you do with it. ---"Love"
That's quite a nice stash of GREEN sewing!! Oh, those squirrels! They are tricksy little folk! It looks like you've had fun with the other blocks while you're waiting! LOVE that Spotlight block. Those olives and blacks are fabulous together. Nice blocks and projects, I really like the Spotlight block, not sure what the colours should really look like, but I do like what I see. That film strip block is terrific! SO clever. These green RSC blocks are some of my favourites so far. The Filmstrip block is wonderful! I might want to make one myself. Is it paper pieced? That is how I would do it. And I thought the film strip block was a Christmas tree skirt. Of course, it probably isn't big enough, but I couldn't really tell what size it was from the picture! The Arcadia Avenue block is amazing, it looks so complicated! You will have that quilt finished in no time! 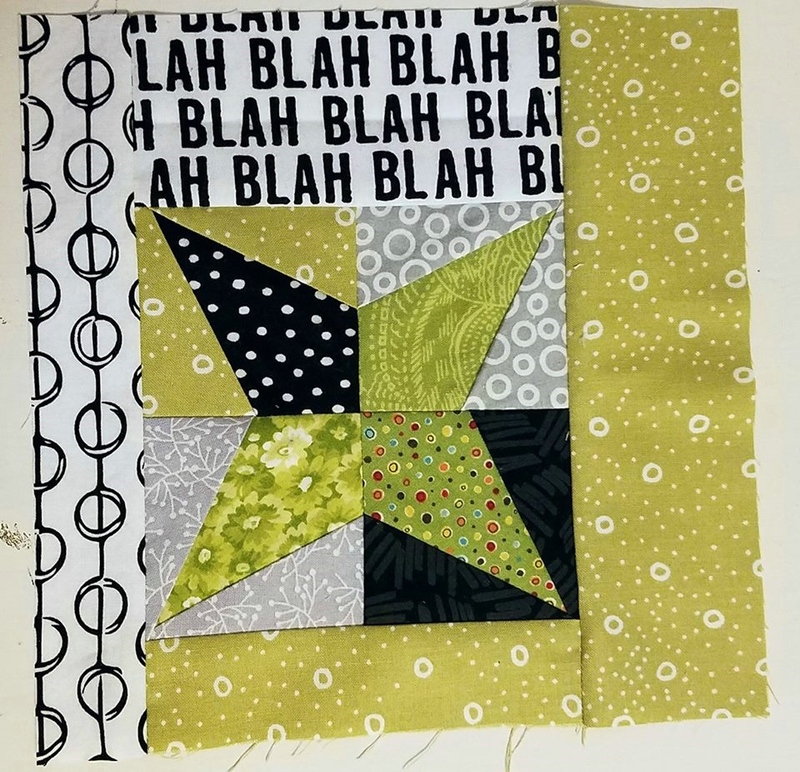 The green blocks are so interesting and I love the little stars! Have fun!